Things that never go out of style: a little black dress, a great set of heels, a Big Mac, Disneyland, and evergreen wreaths. Evergreen wreaths are so absolutely perfect in December. I have fallen in love with the simplicity of a fresh evergreen wreath. While I love the wreath all on its own, I find that most people want to jazz up their wreaths. I have compiled a few ideas for inspiration when you are contemplating the best accessory for your front door. The first inspiration picture I found was of these adorable ice skates hanging in the center of the wreath from Dear Lillie Studio. If you aren’t following them on Instagram, do it now! I love the classic feel of the skates inside the wreath. My mom has hanging mittens inside of the wreath on her front door. So adorable. My second inspiration picture was found on The Willows, another adorable blog with great ideas. The large, chunky bells are a great contrast to the fresh, romantic evergreen branches. Not only do these look amazing, but they smell heavenly. The first inspiration picturewas found here. The second inspiration picture was found here. I’ve never successfully dried citrus before, but maybe that’s something I should try this year. I found a great tutorial on how to dry citrus here. 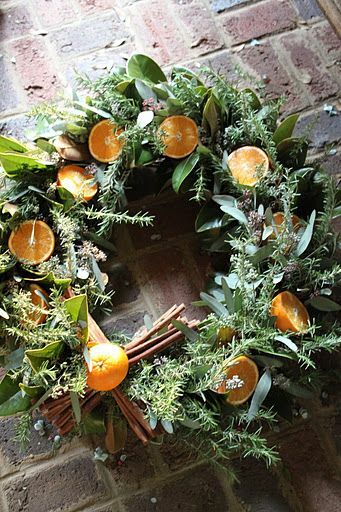 I would use wire to attach the cinnamon and fruit to a wreath. I love love love using foraged pieces in my work. The first idea is here. Pinecones are an easy addition to any wreath, because you can find them almost anywhere. If you don’t live close to a pine tree, they are all over grocery stores and craft stores this time of year. I would use wire to attach them! The second inspiration picture is from Design Love Fest. The final inspiration is from Pith + Vigor. Using berries, grassheads, and other piece that are in season add a lot of texture and dimension. This is the easiest way to add color and variety to your wreath (I think). Just tie a piece of fabric or ribbon to your wreath and you’re done! This picture is an original from Poppies and Peonies Design. I am so in love with the black and white lumberjack plaid over here! I use it everywhere. I love the frayed edges of unfinished fabric, so I just cut a strip of fabric and tied it on. You can add fabric to the top or bottom of a wreath, but I also really like to add ribbon to the side. I think it gives it an asymmetrical look, which I am always all about! 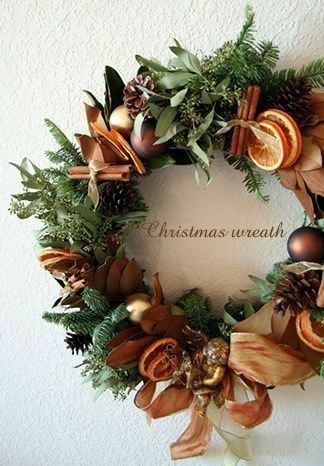 If you are a local follower, you can shop these wreaths and our evergreen garland in our online store!